Glass is being carelessly overused by too many Architects and building designers. on the occupiers of uber glazed buildings. Too much glass and glass in the wrong places makes a building thermally inefficient to run, consequently unsustainable, impractical and not comfortable. Even the best triple glazed windows are only ½ as effective as an insulated wall at preventing heat transfer. Every window is an efficiency deficit requiring additional heating and or cooling energy. Therefore less windows equals better thermal efficiency and lower energy costs. Designers and Architects know about passive design principles, so why do so many ignore them? Possibly they don’t fully understand the importance of passive design and how to best apply it? In the indulgent world of bigger is better passive design is ignored in favour of exuberant client demands. These are often and blindly followed by designers without them providing advice about the importance of passive design and better use of glazing? Perhaps designing a ‘look at me’, ego project or piece of Art, which might look great, distracts from providing a comfortable, functional living space? At Capital Building we know less glass is not a hindrance to providing a pleasing design. Of course, windows and the light and views they provide are important. There is little need to compromise with windows, providing they are correctly sized, orientated and protected. Double or triple glazed and sealed airtight including any opening sections, when closed. Made of Timber, UPVC or Thermally broken Aluminium. Plantation timber has the lowest ecological footprint. Glass makes high demands on resources to produce, so less is better. Large windows should be placed to the north in conjunction with living areas such as: living, dining, kitchen, rumpus and study rooms. Large North windows should have approx. 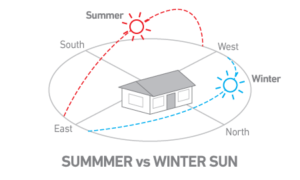 1m eaves to shade them from summer sun but let the sun warm them in winter when it is moving across the sky at a lower angle. North facing windows can be further protected with heavy drapes encased in a quality pelmet. This creates another air gap to prevent heat loss, from the inside, through the glass in winter. Their northerly orientation, in line with the arc of the sun provides uninterrupted light all day long, year round. Should be kept to a minimum, small windows providing access, light and ventilation for rooms such as laundries bathrooms and bedrooms. Internal drapes and or blinds for heat loss. 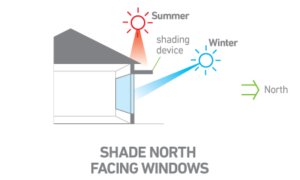 South facing glass is always in shade so won’t require external awnings for sun protection. Keep them to a minimum as per south windows. The only difference is they need to be protected by external awnings to prevent morning and afternoon sun heating them up on hot days. Capital Building designs are always mindful of the efficient use of glass and other sustainable building materials. Energy efficient design does not force any onerous design limitations or costs. We feel in most cases sustainable design only adds positives to the final outcome.